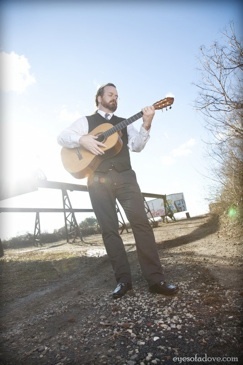 Atlanta classical guitarist Keith Gehle is one of the city’s busiest musicians and has performed his inspiring music for listeners all over the Southeast for over twenty years. A native of Augusta, Georgia, Keith is well known among Atlanta event planners and is a top referral for many of Georgia’s finest venues. As an instrumental guitarist he provides the ideal accompaniment to gatherings where a band or vocalist would be too much. Though well suited to the intimate setting, Keith can easily play for larger crowds thanks to his state of the art amplification system. His custom made guitars and acoustically tuned pickups provide a clean, clear ambient experience no one else can match. Keith’s music is diverse and includes such styles as Spanish and Latin works, pop standards, original solos, a great assortment of Beatles songs, light classical and even a few blues numbers. There’s something for everyone on Keith’s play list. No matter what the setting, an evening concert, elegant wedding or corporate gathering, Keith Gehle delivers to his clients the very highest level of artistry and professionalism. Reasonable rates, reliable service and a top quality performance are guaranteed. Please Call or Write today to schedule the beautiful guitar music of Keith Gehle for your next special event. I have been meaning to write you to tell you how wonderful all the music was on the evening of the wedding... you sounded INCREDIBLE, and the guitar really made for a really lovely & unique ceremony. I can't tell you how many guests have complimented us since the wedding about how great you were & how much they enjoyed hearing you play during cocktail hour. I think that was the first time that many of our friends & family had been to a wedding that featured a classical guitarist! The ambiance you created that evening with your playing was wonderful, and Roy and I will certainly take the time to visit the websites you mentioned & sing your praises via written review. Thank you SO much for being part of our big day, and I certainly hope we have the opportunity to hear you perform again in the future... we'll be sure to join your fan list on Facebook so we can stay posted on events of yours down the road.